Here is a quick article to share with you some recent apps I have been using/trying. The first one is an app developed by Philips called Vital signs which works on an Ipad 2. 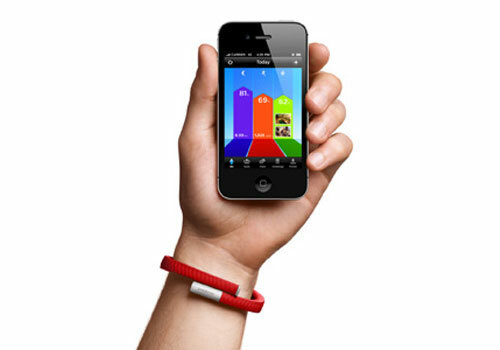 The Vital Signs App by Philips, allows for heart rate and breathing rate analysis. Simply place an iPad 2 on a table in a well lit room , place your face inside the box on screen and the app will determine your heart rate and breathing rate. Heart rate is actually calculated by comparing the tiny changes in colour of your face which occurs as a result of changes in blood flow. The measurement of breathing rates occur via simply detecting and counting the rise and fall of the users’ chest. 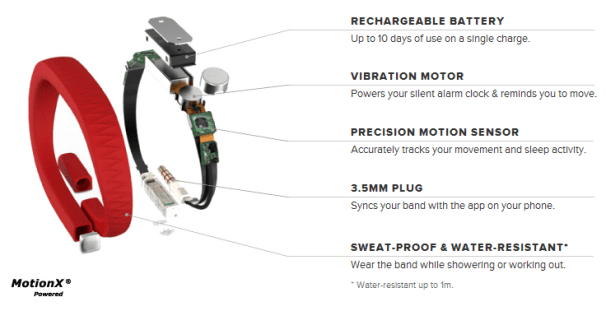 The accuracy seems to be pretty good in well lit areas and in normal breathing conditions. I will do more testing in the next few weeks and present some results here. The other very interesting app is again free and has been developed by Dr. Grant Abt called Training load. Training load allows anyone to record and track the ‘dose’ of exercise for a single person with two common methods used by sport and exercise scientists – Session-RPE and the Training Impulse (TRIMP). Both methods integrate training intensity and training duration into a single number (arbitrary unit) representing the overall dose of training. The app allows the storage and sharing of the training data and it is completely free. 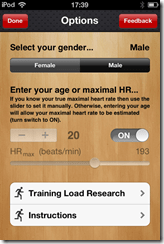 Training load is available on the apple store and works on iphone and ipod touch. 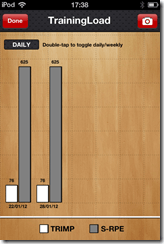 Tapping on ‘View Graph’ will display the data as both individual sessions (labelled DAILY) and as weekly totals (labelled WEEKLY). The weekly graph for TRIMP also displays the percentage change from the previous week. The weekly graph for Session-RPE also displays the monotony, percentage change from the previous week, and strain. Monotony is a value that describes the variation in the training load, with higher values representing less variation. Strain is calculated as load x monotony and displayed on the weekly graph as a black circle connected with lines. Strain represents the combined value of load and monotony, so if the load is high and there is little variation in that load then the strain will be high. The monotony values are colour-coded green (good), orange (caution), or red (danger). As for monotony, the percentage change in weekly loads are colour-coded to show the magnitude of change – green (optimal), orange (high), and red (too high). It works really well and it is a simple free tool to track the training dose and the perception of loading of your athletes wherever they are.